Uha fish broth with Celery. Recipes from Russia. 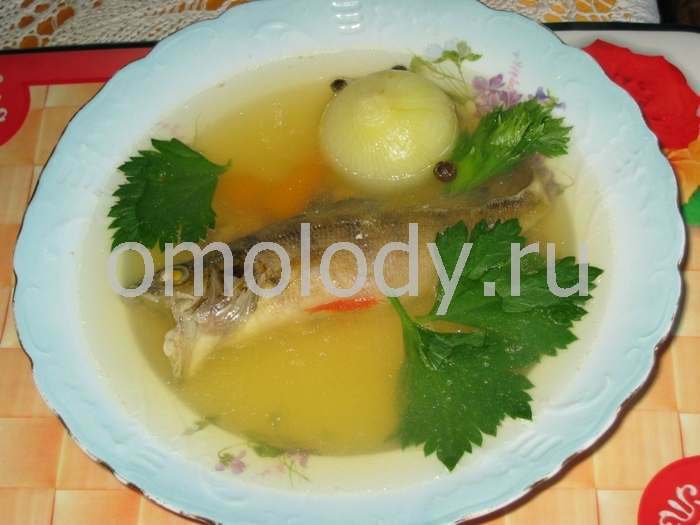 Uha - Fish broth with Celery. 1. Take perch and ruff or other small freshwater fish, clean it, but don't remove the scales, and wash it. Put it in a pot with cold water and bring slowly to the boil. Skim off the froth, add parsley roots, onion, celery, big peaces of carrot and simmer for 40-50 minutes. 2. Ten to fifteen minutes before the soup is cooked season with whole peppercorns, salt and bay leaves. Strain the broth, discard carrot, parsley roots. (By the way, my cat love very much to eat the carrot cooked in the fish broth). 3. Before serving, in the fish broth put a piece of cooked fish and decorate with Celery.